The year was 431. 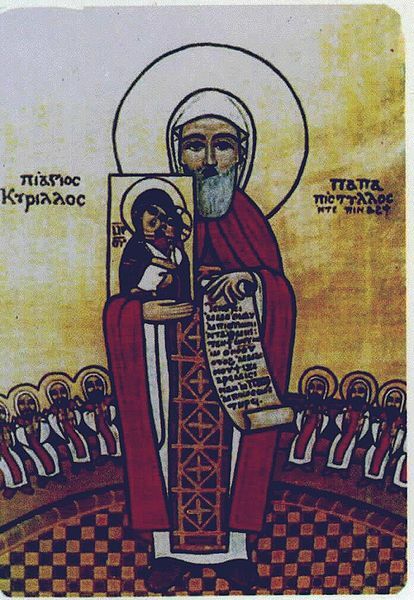 The Christian Church had called an ecumenical council at Ephesus to address the teaching of its Archbishop of Constantinople, Nestorius. Nestorius taught that although Mary was the mother of Christ the man, she was not the mother of Christ, the Son of God. Rather, Mary gave birth to a mere mortal who was subsequently “occupied,” as it were, by God. Under the leadership of Cyril of Alexandria, pictured above, the council declared this teaching heretical and affirmed a doctrine known as the hypostatic union – that Christ is completely God and completely man. He is not merely occupied by the Divine, he is the Divine. The word “hypostatic” is from the hypostasis, meaning “substance.” The hypostatic union, then, is a doctrine that declares that two natures – Christ’s divine nature and his human nature – are contained in his one person, or substance. It is this Greek word which we encounter today in our reading from Hebrews 11: “Now faith is being sure of what we hope for and certain of what we do not see” (verse 1). The Greek word for “sure” is hypostasis. Thus, this verse might be translated, “Now faith is hope with substance.” Accordingly, faith is not just wishful thinking, it is substantive. It hopes in something, or more precisely, someone, who is tangible and true. The church father Bernard of Clairvaux comments on this passage thusly: “The substance…of things hoped for [is] not a fantasy of empty conjectures…Under the name of substance something certain and fixed is put before you” (Some Letters of Saint Bernard, 272-273). What is this “certain and fixed” substance put before you? The One in whom the hypostatic union comes together, of course – Jesus Christ. This is why the preacher of Hebrews finishes his exposition on faith by exhorting us to “fix our eyes on Jesus, the author and perfecter of our faith” (Hebrews 12:2). Jesus is the one who gives substance to our faith. Therefore, he is to be fixed before our eyes at all times. It is fashionable these days to extol a faith which, rather than having Jesus as its substance, finds its substance elsewhere. Pastor Josh recently shared with me an article from USA Today in which a researcher from the Pew Foundation hailed the syncretism of Americans as a sign of “spiritual and religious openness.” This article chronicled how more and more people are meshing nominal Christian beliefs with other false beliefs, such as a belief in reincarnation, or Kabbalah, or pantheism. These people take a smorgasbord approach to faith – you choose whatever doctrines from whatever religions you desire and then synthesize them into your own personal faith. This kind of faith does not find its substance in Jesus, but in the personal whims, preferences, and desires of its believer. The orthodox Christian faith is most certainly different than this kind of cafeteria Christianity. For orthodox Christian faith finds its substance in Christ and Christ alone, as the apostle Paul passionately declares: “For I resolved to know nothing…except Jesus Christ and him crucified” (1 Corinthians 2:2). This is the faith for which those at the Council of Ephesus, and many since then, have so earnestly contended. What is the substance of your faith? Is it your own personal whims, which can change and shift according to your mood and will? Or is it the rock solid, never-changing, ever-faithful Jesus Christ, who is both God and man? I hope it’s the latter. For faith in Christ – and faith alone in Christ – is the sole source of true hope for salvation.